This is the fourth in a five part theme week marking the centenary of income tax in Canada. Here we are again. If you’ve studied history or lived a decade or two after forty, you’ve noticed that some battles are fought over and over and over again. Those repetitive, “I can’t believe we’re still debating this!” struggles mark itchy, scratchy places in our society, the places where the imperatives of institutions and “common sense,” markets and human needs contradict each other. So “same old, same old” really means “this is hot stuff.” In the history of the income tax, much of the hot stuff shows up around family. And sure enough, family matters appear in the federal government’s current proposals to make income taxation more fair. One aspect of the Morneau proposals targets the use of the breadwinner / homemaker / children family as a tax dodge. Or, to be less provocative, one might say the proposals target the use of one kind of family as a means to minimize tax, perfectly legal. Opposition MP Michelle Rempel moans, how can a government “change the rules” and call the change “fair”? Is the finance minister calling people who follow the rules “crooks”? Amid all this heat, a bit of tax history might be calming. The distinction between what is avoidance – legal – and what is evasion – illegal – has changed before, and will no doubt change again. Rempel presents herself as defending law-abiding folk who face the shutting down of ordinary good business practices, ways of saving and spending that are both legitimate and socially useful. But those practices are not natural rights. They are more like tactics in a sport. They are merely ways of using current law to the taxpayer’s best advantage: tax avoidance practices, also called tax planning. As the world changes, so may tax law, in the future as it has in the past. The boundary between avoidance and evasion is historical, driven by events and our responses to them. In the Anglo-Canadian world, a landmark event in the 1930s pretty much invented the distinction between avoidance and evasion. On May 7, 1935, the Judicial Committee of the Privy Council found against the Internal Revenue and for the taxpayer in the appeal of the despicable (for other reasons) Hugh (“Bendor”) Grosvenor, 2nd Duke of Westminster. Westminster had reduced his income tax assessment by an accounting move that the person on the street can hardly have regarded as fair, and that the tax authority thought was evasion. The majority of the JCPC called it avoidance. Westminster had figured out that, if he paid his approximately 100 household and estate staff one way (by means of income from annuities) rather than another (ordinary wages), he could significantly reduce his taxable income, and avoid a surtax. Westminster was enormously wealthy. His family owned much of Mayfair and Belgravia in London. He ostentatiously enjoyed his wealth, revelling in Rolls Royces, yachts, horses, mansions, and gifts of lavish gems to a series of girlfriends and wives including, for a time, Coco Chanel. To his credit was a Distinguished Service Order (DSO) earned in active combat during the Great War. To his shame was keen support for Hitler during the 1930s and 1940s and a hatred of homosexuality that makes Lord Alfred Douglas’s dad look like a member of PFLAG. Westminster was an active member of Britain’s extreme and anti-Semitic right in the interwar years, and a tailor-made villain for tax history. No mere government was going to make Benny Grosvenor pay some ridiculous surtax on high incomes. Even if we don’t much like the man, Westminster, the decision in Westminster usefully established a tax filer’s right to arrange his or her business affairs so as to pay the least tax legally required, a right to avoid that defends all of us against the risk of overweening tax administration. But Westminster was also the charter case of aggressive tax planning. Before the change in statutory interpretation led by Westminster, the tax authority was allowed to investigate whether a business transaction (paying a salary, renting a property, borrowing or investing money) had a real economic purpose – substance – or whether it was just moving money around to avoid a proper tax liability. After Westminster, tax authorities had to invent new ways to determine whether a tax filer was, like the Duke, doing one thing and calling it another, taking advantage of words in the tax statute to produce a result contrary to the legislators’ intentions. 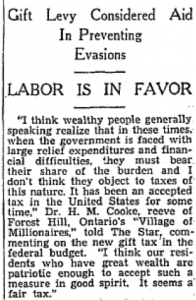 One new way that governments found to shut down clever tax schemes in the 1930s was the gift tax. Is a so-called “gift” really a gift when the giver is your rich uncle Edwin, who signs over to you the deed on one of his apartment buildings on the understanding that you’ll loan him back the rental revenue at zero interest for an indefinite term? You don’t earn much from your job slinging donuts, so your tax liability on the rents will be smaller than Edwin’s would have been. When Edwin in the end gets that rental income and pays “your” tax bill, he’ll still be keeping more of his money. And he’ll owe you at least a favour. 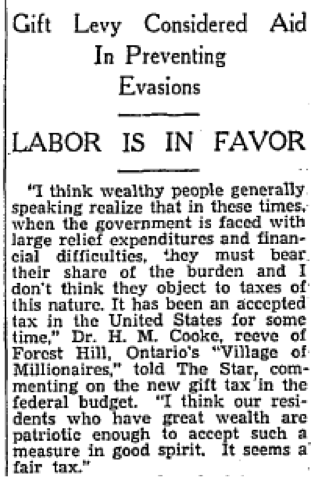 In June 1935, the Canadian federal government started levying a tax on “gifts” like that one. According to a new rule in the Income War Tax Act, the generous “giver” of this sort would have to pay the government a percentage of the value of the gift (ranging from 2 per cent to 10 per cent). Uncle Eddy could still give his niece (or even one of his employees) that income property, but he’d have to fork over some cash up front for the tax advantage that he was busy arranging. 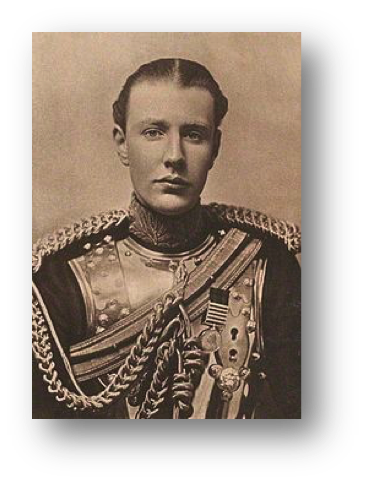 A number of countries enacted gift taxes in the 1930s, precisely to close the kind of gate through which the Duke of Westminster had escaped. As credit markets crashed and worker misery grew to near-revolutionary levels, governments powered up their tax enforcement efforts and raised taxes on the poor, the middling, and the rich alike. Wealthy Canadians began, like Westminster, to “give” previously undeclared income-earning assets to people within their control, to prevent the assets’ being discovered and so to avoid the subsequent tax bill. Facing the newfound earnestness of the state’s effort to enforce the tax law, various Uncle Eddies felt a strong incentive to divide some property among lower earning kin, and thus legally to minimize their income taxes. Today, the tax authority has more precise methods (attribution rules) to track who really should pay the tax on income-generating property that is transferred within families. However much more precise, those rules still address the same question as did the gift tax of 1935. Is it right for the highest earner in a family to “sprinkle” some of his (or, less often, her) income among offspring (or nieces or grandchildren) and spouse, so as to reduce the overall income tax paid by the family as an economic unit? Our law has tended to say no, because sprinkling and splitting shrinks the overall tax base in ways that benefit only some kinds of families and mostly higher income earners. Income sprinkling benefits substantially only those families that have just one member who earns a lot (or who has lots of investment income). Childless single people, families that live on a smaller single income, or families with two similar incomes can’t reduce their taxes much or at all in that way. The truly small business person, even if married with kids – the donut franchisee versus the plastic surgeon – sees only a small dollar amount by way of benefit. Tax scholars call splitting and sprinkling an “upside-down subsidy” – a tax expenditure that benefits taxpayers more and more as you go up the income scale. All taxpayers, happily or grudgingly, subsidize the tax reduction that is enjoyed by those who can use family for this purpose. Despite its dubious and discriminatory impact, the appeal of this tax avoidance strategy seems never to die. It was enthusiastically pursued in the 1950s but successfully opposed by federal tax policy makers, both Liberal and Progressive Conservative. In the 1960s, tax reformers tried to make family income sharing less selective (but lost the fight), and an argument for marital wealth splitting (as distinct from income splitting) is still being made and is worth exploring. In 2014, disagreements on a simplistic form of marital income splitting divided Steven Harper (in favour) and his finance minister, Jim Flaherty (against). Regardless of party, finance ministers aren’t terribly keen on the sprinkling and splitting – these practices erode the revenue and don’t serve a broad economic objective. Now, a Liberal finance minister proposes reforms that will take away one of the few remaining routes to income-sprinkling. It isn’t an especially partisan move: Morneau proposes merely to extend the reach of a penalty against income sprinkling to children that, though introduced by the Liberals in 1999, was bolstered by the Conservatives in their 2014 budget. In tax planning circles, that penalty is called the “kiddie tax.” The kiddie tax was a bit like the gift tax of 1935. It doesn’t prohibit transferring income to one’s minor children, aged 17 or under. It just makes it prohibitively expensive to do so, by charging a Tax On Split Income (the TOSI, as the kiddie tax is called in scholarly circles). Morneau now proposes to apply the same tax to income sprinkling among children aged 18 to 24. Perhaps Morneau has noticed that there has been a change in the life course of young middle-class adults, who are now less likely to be independent in their early 20s. A tax law change might reflect this kind of social change in family relationships. Or maybe Morneau is just trying to stem a substantial drain on the federal revenue that resulted when, in 2005, Dalton McGuinty’s Ontario government handed doctors a tax shelter (not then available in every province) by allowing them to make their practices into private corporations and cut their tax rate by something like 30%. Federalism complicates tax policy, to put it mildly. For reasons such as these, tax laws sometimes must be changed. The overall project of a progressive rate tax on personal income is to collect a revenue in ways that reasonably reflect earners’ and investors’ ability to pay. Governments may miscalculate ability to pay, and taxpayers should let them know if that happens. Efforts to follow in the Duke of Westminster’s footsteps are one way to protest. But to think that a particular method of tax avoidance is a right, rather than just an opportunity arising from possibly short-lived circumstance, is to misunderstand the forces that are constantly at work on tax law. When the McGuinty government gave Ontario’s doctors a new tax break, he was allowing them to take a bite out of the federal income tax revenue. I’d be surprised if McGuinty worked that out with the federal government of the day; by constitutional law, he didn’t have to. And when some doctors, along with lawyers and others with personal corporations, used them to sprinkle income among their young adult children, they cannot be entirely surprised if the childless among them do no see a valid equity argument expressed in their chosen form of protest. I would not accuse Ontario’s doctors or small businesses of being crooks. Few among us will forego a rich tax advantage that the law offers us. Our governments don’t expect us to. But when something in the world changes and, as a result, inequities arise among taxpayers, we might lose a tax advantage. In fact, it’s kind of the job of a government to see that we do. And when inequities are related to the kind of family we live in, we should especially expect our governments to be alert. Family and tax laws have a long, and sometimes suspect, history together. Shirley Tillotson is an adjunct member of the Dalhousie University Department of History and an Inglis Professor of the University of King’s College. Her most recent book is Give and Take: The Citizen-Taxpayer and the Rise of Canadian Democracy (UBC Press, October 2017). Charitable gifts were exempt from the tax, as were gifts totalling less than $4,000 in value. There was no giving assets to the wife and kids to avoid tax: all such property was already taxed in the hands of the father and husband.